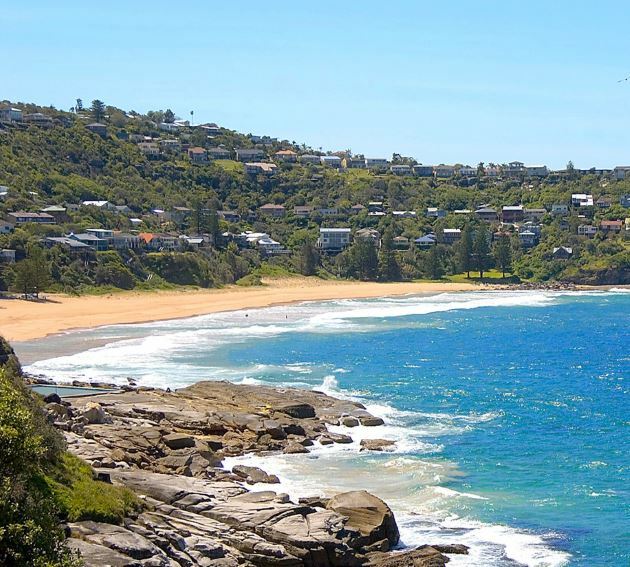 Located a convenient fifty minutes away from the Sydney Australia city centre and situated between Palm Beach and Avalon Beach, Whale Beach is an attractive beach with golden sands. Not as popular as other northern beaches as Manly or even Palm Beach, it is a good place to relax and enjoy the day out from the city. Apparently named after a dead whale that was found there when the area was first visited by the early European explorers, See Australia History. Today, with a bit of luck and a sharp eye, you can still spot whale pods in their season when migrating north to their breeding grounds or back to their feeding grounds in the southern ocean. At the beach there is an accessible rock pool for calmer swimming, great for the little ones. The Wedge, a well known surf break popular with local and visiting surfers is on the northern end of the beach. Not far is the Pittwater on the other side of the peninsula. Popular activities around here include surfing, hiking, cruises, deep sea fishing and sailing. Established in 1937, Whale Beach has an active Surf Life Saving Club. They are a well trained volunteer organisation, there for you and your family’s safety, providing surf patrols and rescues. Please observe their directions and swim between the flags. Off Barrenjoey Road, how to get there: Wynyard Bus 190. The route follows the long and windy road, with plenty of scenery of other beaches and leafy suburbs along the way. Stops 210723. Barrenjoey Rd near Whale Beach Rd and 210835. Barrenjoey Rd near Surf Rd. Palm Beach was and is still home to the rich and famous of Sydney. Real estate here will hold its value and increase, due to its desirability and natural surrounds, and relative closeness to the Sydney CBD (Central Business District). Other beaches nearby include Whale Beach and Avalon Beach. As was mentioned, Palm Beach had long been the playground of Sydney’s rich and famous. But now you can take the bus there and enjoy it for yourself. Covering Up - Sydney has bright sunny days so wear sun-protective clothing, especially between 10am to 3pm. Find a good SPF30+ sunscreen that is water resistant. Use shade and wear a hat, it all helps to stay looking young, healthy and beautiful as you do.